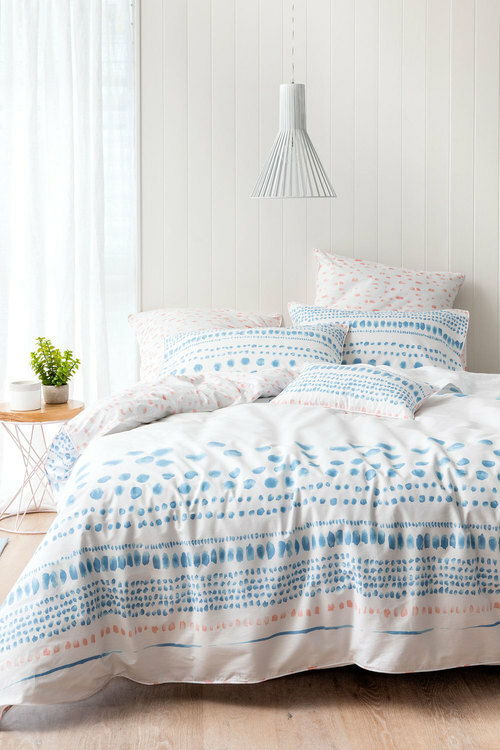 Looking for a stylish duvet cover? EziBuy's extensive selection of Duvet Covers provides you with a one stop shop: whether you're looking for yourself, for a child or for a thoughtful gift, we have a duvet cover to suit any possible requirement. 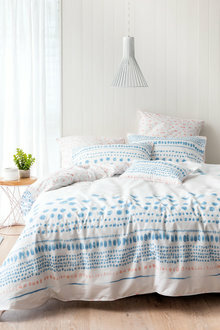 The Juno Bedpack is the perfect example: available in a complete range of sizes, this fantastic pack offers incredible value, comprising one duvet cover, standard and European pillowcases and a filled cushion to add the perfect finishing touch to your bed furnishings – all in quality 225 thread count cotton. But this bedding choice isn't just practical – it's a stunning choice too: the subtle but creative print resembles daubs of blue paint on a blank white canvas, beautifully accented with smaller dashes of blush pink. This is a design which achieves that difficult balance of providing graphic visual appeal while remaining neutral enough to suit a wide range of settings. The Juno Bedpack is a natural choice for a guest bedroom or holiday home, but it's so attractive you may want to keep it all for yourself.